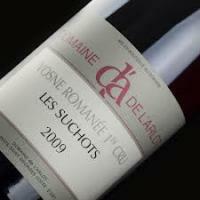 2013 Domaine De L'Arlot Vosne Romanee Les Suchots - $129.99: Vins Rare, The finest selection of rare wines. An intensely floral nose exhibits a broad range of spice elements that include anise, clove, exotic tea and cinnamon hints along with a ripe but cool array of both red and black pinot fruit scents. There is a lush, even opulent mouth feel to the medium-bodied flavors that presently display a touch of austerity that I doubt will last very long. Lovely juice with excellent aging potential. Burghound 91-94 Sweet Spot Outstanding!